The Award will be based on distance. It will start at a basic level of 50km. Endorsements will be available in 50km steps. Endorsements may be claimed for activity on each band. An Activator may claim this award based on ACTIVATING the hill. Normal QUALIFYING criteria will apply for claiming this hill for other SOTA awards. For the purposes of this award the Activator may activate the hill as frequently as wished over a year but may only claim it once per calendar day. Chaser rules will apply as normal for the usual SOTA awards but Chasers may also claim for the microwave distance award. One station MUST be on a SOTA summit. 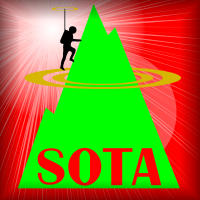 There will be a special category of the Summit to Summit Award, where both ends are on qualifying SOTA summits, but will be based on the distance between them, not just the fact they were on SOTA summits (such contacts can also be included in the regular S2S award). The award will be jointly awarded by SOTA and UK Microwave Group. It will be administered by SOTA with oversight from UKuG.